An ever-green revolution implies the enhancement of productivity in perpetuity without associated ecological harm. In Sustainable Agriculture: Towards an Evergreen Revolution (1996), 219. Also quoted himself later, in 'Science and Shaping the Future of Rice', collected in Pramod K. Aggarwal et al. (eds. ), 206 International Rice Congress: Science, Technology, and Trade for Peace and Prosperity (2007), 5. It appears that all that can be, is. The Creator's hand does not appear to have been opened in order to give existence to a certain determinate number of species, but it seems that it has thrown out all at once a world of relative and non-relative creatures, an infinity of harmonic and contrary combinations and a perpetuity of destructions and replacements. What idea of power is not given us by this spectacle! What feeling of respect for its Author is not inspired in us by this view of the universe! 'Premier Discours: De la Manière d'Étudier et de Traiter l'Histoire naturelle', Histoire Naturelle, Generale et Particulière, Avec la Description du Cabinet du Roi (1749), Vol. I, 11. Trans. Phillip R. Sloan. Science has its being in a perpetual mental restlessness. From 'Poetry and Science', in W.H. Harlow, Essays and Studies by Members of the English Association (1932), Vol. 17, 12. 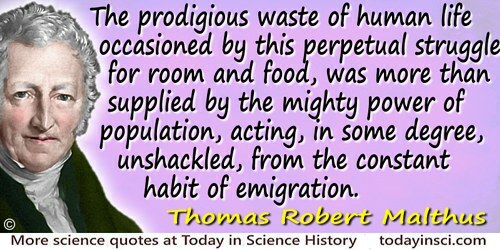 The prodigious waste of human life occasioned by this perpetual struggle for room and food, was more than supplied by the mighty power of population, acting, in some degree, unshackled, from the constant habit of emigration. An Essay on the Principle of Population (1798), 48. We did not design our organization to operate in perpetuity. Consequently, our people were able to devote themselves exclusively to the task at hand, and had no reason to engage in independent empire-building.